Have you seen the birds eating? They eat little by little in tiny bites. I wish we would eat like that. Then there wouldn't be this problem of over weight and obesity. Obesity in children is a big issue. I am not one of those who say don't give them butter or fat. They need that for their brain development. Portion control should be followed by not only adults but by kids too. Keeping this in mind, when I got another opportunity to host Srivalli's Kid's delight series this month, I chose the theme as 'Mini Bites'. Thanks to Srivalli for brainstorming with me on the theme. I was kind of confused on the topic. Make anything that your kid likes or you liked as a kid or a kid you know likes. Make it into a smaller portion. Half or even quarter of the size of the full serving works too. You can start sending me the entries from tomorrow, 16th of June and the deadline is 15th July 2011. There is something different about it too. It will be a running roundup. Once I receive the first entry, I will create a post for it, which will be updated every time I get another entry. That way, if there are people whose kids like the same thing, they can give it a shot without waiting for the final roundup. I will update the running roundup page within 24 hours after receiving the entry. Make something that your kid (niece, nephew or any other kid that you know) likes and is a mini bite. Dishes have to be vegetarian. Eggs are allowed only in baked goods. Send your entry with the link to this page and Srivalli's announcement. 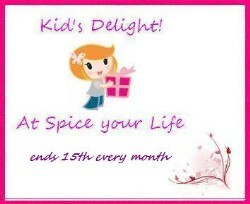 Email is to be sent to versatilekitchen@gmail.com with the subject 'Kid's delight'. Your blog name, dish name, a picture of size 200 X 200, link to the URL of the post. Non bloggers are very welcome to send the entries too. There are no limits for the entries but, the creation has to be in the current month. No archives please. For more rules, refer here check out the rules if you have any doubt. What are you waiting for? Get cooking, baking. Mini crackers, mini pretzels, mini muffins, mini cupcakes, small sized cookies, mini dosa, mini pancakes, mini idli etc. Will send my entry this is a great idea.